Once I get started it’s hard for me to stop. I’ve been obsessing over 2 of the projects I featured earlier. It’s such a simple design and yet I love it. I see myself wearing it as a layer — maybe with a lacy, slightly ruffled cap sleeved T underneath. I could go for black and have the option to layer various shirts underneath it. Or I could get out of my black/brown/dark blue rut and go for a real color. I’m always afraid to knit with color — not because I don’t like color (although that’s a bit true) but mostly because I’m afraid that I won’t be able to wear it much if it’s a memorable color. I need to get over that. It’s knit in Alchemy Bamboo. I’ve just learned to love bamboo yarn but I’m not sure I like the sheen or weight of bamboo for this project. 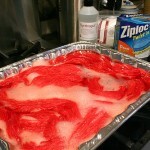 A mercerized cotton might have a little less sheen. 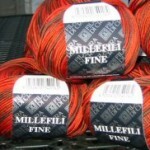 I have some Milli Fille Fine that I played with a while back that might work out nicely. And bonus — it’s a stash yarn. It’s a deceptively simple top but the details are really attractive to me — the slight gathers at the tip of the V, the graduated depth of the ribbing, and the way the neckline curves inward the last couple of inches. It’s a very flattering top. The yarn choice enhances the design too, and that’s where I get hung up. Phil Eponge is a boucle made of Cotton, Acrylic, Polyamid and Elasthanne (which I believe is a Lycra-like elastic). I’m not sure if I’d like the way the yarn feels, but I bet the top is lightweight, holds its shape well, and even has a little give. 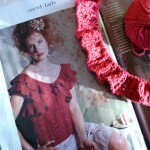 The yarn probably enhances those little gathers so I need to think carefully about what to use. Any thoughts or ideas about either of these? I’m not a big warm weather knitter but I’d like to change that. Now that it’s my fourth MDSW I’m thinking ahead. And damnit I WILL wear something handknit. I really love that top from Phildar, I have not seen it before. I have no clue what Elasthanne is but the other night looking through elann’s I noticed a couple of yarns that contained Elastane (maybe it’s just the difference btwn English and French spelling) neither of the yarns were stretchy looking, then again it was only like 1%. One was a bulky yarn but the other I remember because the name made me smile – Mister Joe Blanket. Not sure if that helps at all but what the hay. I am so with you at finally wearing a hand knit to a big wool show. 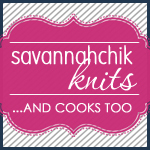 Way to many questions asked about my Lands End cardigan I wore last year to Rhinebeck. Very cute tops. I wonder if the second one could be worked in either Cascade Fixation or Rowan Calmer, depending on the gauge. The only thing I’ll say about Fixation is it’s fairly textured, can look a bit terry cloth like, but it definitely has the memory. I like the lace nightie, too. I love wearing lacy tanks over my boring tanks. It’s so hard to look forward to spring with ice/snow on the ground, but I know it’s coming! I love that lace tank too. As soon as I saw it, I printed it up. Wow, they’re both great. I’m thinking that the Phildar knit might be a bit more practical. But then again, being practical is not all that it’s cracked up to be. It seems like maybe you don’t need more motivation to knit tanks, but my favorite thing about warm weather knitting is that you get to the finish line a lot faster without sleeves! 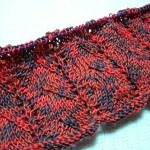 If you hate bouclé yarn as much as I do, I’d definitely substitute with Fixation. 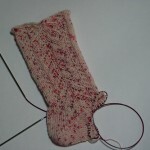 I’ve only used it for socks but I love its elasticity and its ability to hold its shape. I love the nightie! I actually think both could be practical. The nightie could be worn through fall, layered over a turtleneck. Go for the nightie. That Phildar top is excellent for all the reasons that you mentioned. Go for it.